One of the very first things I do each morning is to review my website activity for the previous day using Google Analytics. In addition to the 30-day trailing report and tons of drill-down intelligence, one of the newer features is the “Real Time” view. 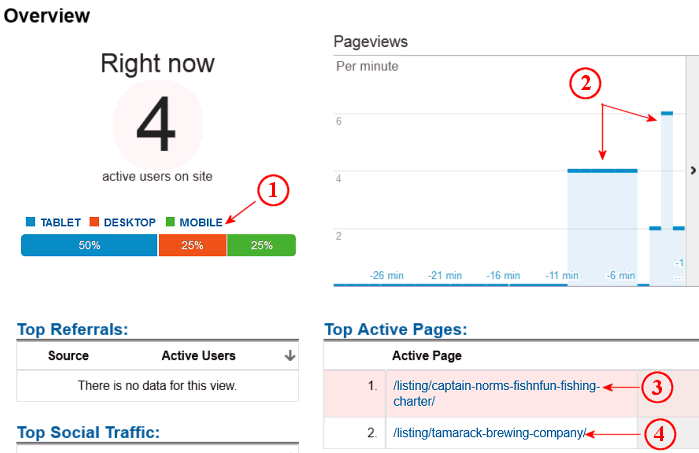 This view shows all activity on the site as it is happening, and sometimes it offers surprising information (see chart below). Readers of this blog know how much I encourage them to make their site “mobile friendly” and how that is such an important feature of the Flathead Guide. Data showing activity for an 11 minute period on July 5, 2014 at 6:50 am. 1.) Mobile Activity – Two visitors using Tablet PCs, 1 smartphone and 1 desktop visitor; essentially 75% of the traffic is from mobile devices. 2.) Page Views – Note that all visitors viewed more than one page with one person visiting 6 pages. 3 & 4) Activity – One visitor was reviewing a fishing charter listing and one was viewing a bar.restaurant. Neither of these businesses were yet open for business. What we can learn from this 11 minute data snapshot? Since these businesses were not open (before 7:00 am), I would assume that this activity indicates that people were planning their day; what to do and where to eat, etc. Granted, this activity changes throughout the day and 4 visitors (in 11 minutes) is not sufficient data to prove a trend, but it does illustrate that at any given moment the traffic to your website is coming from mobile platforms. It also indicates that the Flathead Guide is proving it’s value in attracting customers for Flathead businesses. These visitors searched on a particular topic and clicked the Flathead Guide listing in the search results. They did not choose the actual website for these businesses. What else does this tell us? It possibly confirms that search engines display different data for mobiles than it does for desktops and the Flathead Guide’s mobile-optimized listings ranked higher or were more compelling than the actual website for these businesses. 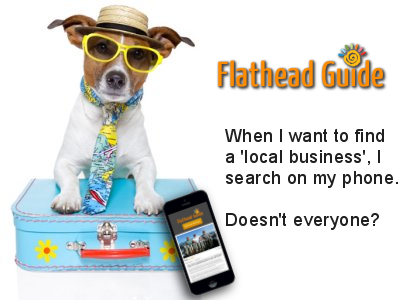 Regardless of the reasons, people clicked the Flathead Guide listing and were presented with a mobile friendly, SEO optimized presentation for local Flathead businesses. Everybody won! The searcher found what they were looking for, and the businesses found another prospective customer. Our new slogan is “Doing Good Things for Flathead Businesses” because it summarizes the benefits we deliver to local businesses. We help them solve their #1 problem – finding new customers and growing their business. Today’s mobile environment makes it mandatory that businesses adapt; the Flathead Guide is an important piece of your marketing mix. List your business today!